While I don't have everything for CoC, I'm open to whatever someone wants to send. Last year it was chocolate and teas. If you are at a loss- when I travel I try to find a collection of local ghost stories. I've a list here to show you what sort of books I tend to pick up. I'd love something of the kind from where my Soggotto Secretto is from. I've gotten pretty much every single CoC book I'll ever need but I'm lacking in source material, could you see your way to sending me a horror movie or book? I'd be perfectly happy with whatever my SS sends me. I have one present in hand, that I picked up during the summer, in expectation of SS. I will actually eat my hat if they have it already. Here is my librarything catalogue listing all entries for Cthulhu in case you'd rather not chance doubling up. P.S. When do we get the name of our SS? I should be fairly easy to find something for. I haven't bought any new Cthulhu roleplaying stuff since 2002! (I've got lots of the early stuff but nothing recent.) The most up to date books I have are Dunwich, Goatswood & Keeper's Compendium 2 - so anything from the last four years would be wonderful. I do have a large mythos/horror/ghost story collection - finding an available mythos book that I haven't got might be difficult. I've a few ideas about what I can feed to my shoggoth - I'm looking forward to finding out who I've got so can find something appropriate. As jabonko said, this is a very weird to do. Call of Cthulhu d20, Call of Cthulhu 5.6, Delta Green, Delta Green: Countdown, Delta Green: Eyes Only, Secrets of San Francisco, Miskatonic University, Kingsport, Dunwich, Dreamlands, Tatters of the King, Arkham Horror, Cthulhu Invictus, Cthulhu Live, Cthulhu Live: Delta Green, Cthulhu Live: Lost Souls, the HPLHS Call of Cthulhu film, all the Worlds of Cthulhu, a couple of The Black Seals, and too many of the Chaosium Call of Cthulhu fiction books to name. Um I dunno, I'm sure what you come up with will be just fine. If you come to the chatroom RIGHT NOW, you too can roll dice to see who gets who. The dice have been rolled, expect your shipping orders within three hours. And I've sent off the names to everyone's yogmail. Good luck and happy shipping. Some of the people have posted things they already have or what they're looking for so that's a start. I have a few miscellaneous books, and toys, but I'll be happy with whatever my SS sends me. Thanks to my SS last year for the great hand made book! Should I wait until the person I drew chimes in with what they want? and in case my Secret Shoggoth is reading...3 words: Cthulhu Car Emblem. I'm just glad I didn't get Paul again. Any MULA, any CoC book for that matter,....or any Cthulhu music CDs. If our Secret Shoggoth is reading, we'd be happy with a MULA Monograph. Any one will do. If my secret shoggoth can't (or, in a need to preserve sanity, won't ) think of something weird without prompting, I have not bought any CoC items/books in over a year. (I have Secrets of Japan, Miskatonic U., and Secrets of New York, but nothing more recent). I have no MULAs; no Q-Workship CoC dice. So, Tatters of the King, Malleus Monstorum, Secrets of LA, Secrets of San Francisco, Secrets of Kenya, Secrets of any other place Chaosium has published recently, Q Workship dice, or any MULAs are all needed items. for CoC. Otherwise, just go bonkers and drop something weird in the post. As long as it doesn't involve Tori Spelling. Perhaps it's at late notice but ,I , myself, might as well post what few items I wouldn't mind recieving from said Secret Shoggie ! MULAS - Return of the Ripper/ Gatsby /Morroco or anything besides the handbooks and Cthulhu Rising. I don't get much chance to roleplay, so I am not really bothered about getting anymore CoC stuff. 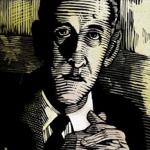 Any fiction is great, I already have most original lovecraft stuff, the Delta Green novels, Hardboiled Cthulhu, Shadows over Baker Street and various others. I already have An Even Scarier Solstice, Call of Cthulhu and At the Mountains of Madness from HPLHS, but would love the first carol CD or the Shoggoth on the Roof CD. Any spooky music is great, and also audio dramas etc. etc. I'm really very happy with anything. Honestly! Don't worry. I have a fair few rulebooks and things, I also have the HPLHS Carol CD's already (they're great, driving my wife insane!). A few ideas - the original Al Azif, a solid gold replica of the R'lyeh disc from Shadows of Yog-Sothoth, or the formula for the Resurrection spell would all be appreciated. Well, I guess I can try to be somewhat helpful. I've already got the HPLHS font CD, CoC DVD soundtrack and poster, AtMoM Audio CD, and Herbert West: Reanimator on CD. I've got Carl Cthulhu, both green and red My Little Cthulhu's. I have quite a few books (a lot), although I don't have "Frontier Cthulhu". I also have quite a few DVD's as well. I really like old time radio dramas, like the kind you find at Decoder Ring Theater and hand made items. I hope that helps out a bit! So ideas for me are Secrets of LA, Sorcerer, The Shadow of Yesterday or The Blossoms are Falling. The last three are indie RPGs available at http://www.indiepressrevolution.com. All I really want for Yithmas is a group to play CoC with regularly, and a time-warping device so that scheduling isn't a problem. Also, a Mi-Go brain cylinder would be great.